Syrinx : XXII — back at work! August at the beach? 'Fraid not! August finds me happily rehearsing a fantastic new program with Syrinx : XXII: António Carrilho, recorders and Raj Bhimani, piano. We are preparing for our return tour to India in November, taking a program of gorgeous works from four centuries, including Bach, Gluck, Schubert and Mozart, works by living Portuguese composers and the premier of a new trio by Sören Sieg, to boot! Raj snapped this cool photo of me warming up on the bass flute for the Sieg work—a rollicking fun and beautiful trio that uses the bass flute to perfection—thank you, dear Sören, once again! Why is the bass flute just so cool? After a day of rest, it's back to work, rehearsing for our upcoming concerts! We were grateful to the Delhi Music Society for the use of their largest room to unpack gear and rehearse for many hours. A great pleasure also to again take up preparing for the premiere of Carlos Marecos' fantastic work written for us, "7 Instantes from Rural Portugal" for flutes, recorders and piano. Marecos is famous for sensuous melodies and harmonies—effortless mastery, really—and we are sure the audience will love the work as much as we already do! Lots of other works, covering five centuries of music, on the program too, so we think there will be something, hopefully many things, on the program for everyone! More photos of the day! Powell Flutes, unpacked and ready to go, plus a lovely Soubeyran traverso! 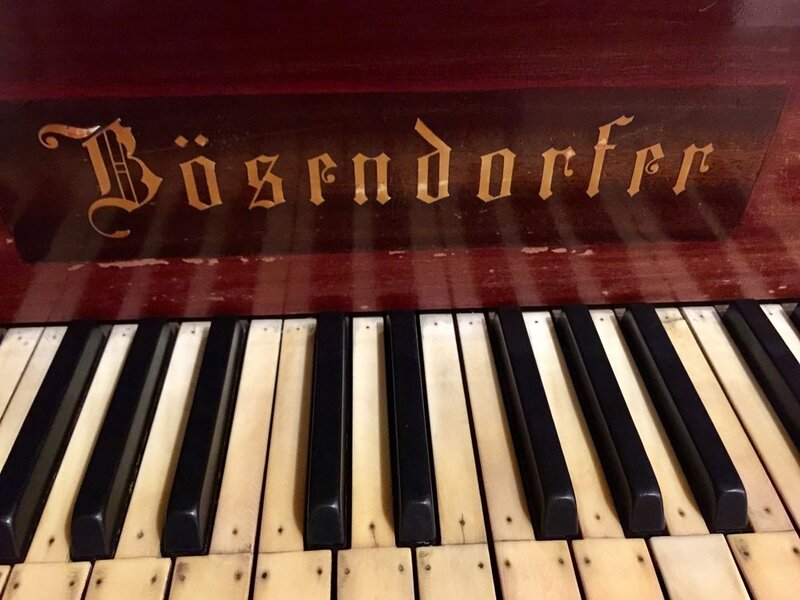 A lovely Bõsendorfer piano owned by the Delhi Music Society. Ivory tops of keys nailed down due to humidity causing the glue to "melt". Masks to protect against the smoke (receding, fortunately) in Delhi—better safe than sorry. 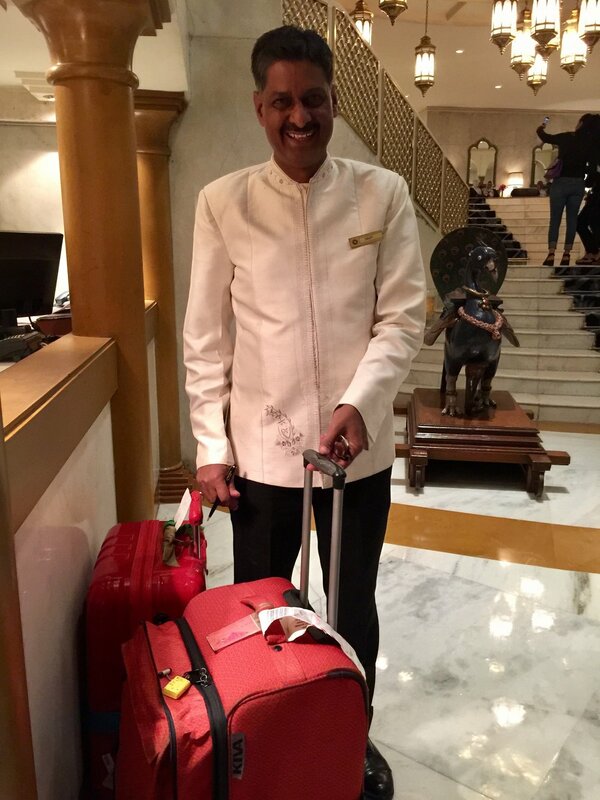 Best news of the day: Hotel Concierge with our delayed luggage! Whew! Bravo, Scherzo Editions of Lisbon! At the last three editions of the Summer Flute Academy, we have been pleased to include João Vidinha, owner-founder of Scherzo Editions. Scherzo Editions has been busy publishing works by Portuguese and foreign composers, mostly living ones, for a variety of instruments and ensembles. As João has described it, he is looking for "fresh" compositions, music that is well-written and stylistically interesting, without following any particular "school". Scherzo Editions is a fundamental element in the Academy's annual Composition Competition for Works for Flute, in that the winning works are subsequently published by Scherzo. Not only is this great for the winning composers, but also for us flutists, since the emphasis at Scherzo is on attention to the legibility and practicability of the score for the PERFORMER! Scherzo's editions are truly a joy to look at and to play from! Recently, along with publishing all the required commissioned works for the Portuguese Young Musicians' Prizes, Scherzo received a FIRST PRIZE in the American National Flute Association's Newly Published Music Competition—right alongside long-established editors such as Bärenreiter Verlag and Theodor Presser Company, which is an amazing achievement! The winning work, by the Portuguese composer André M. Santos, O motivo da menina Laite, for solo flute, will have its US premier at the NFA Convention in San Diego, California, later this month! To purchase, order directly from the Scherzo site. Bravo Scherzo Editions and André M. Santos! !